Stay in Debt for 6 Months or More! The average payday loan borrower will stay in debt for over half a year. This might not sound too bad when compared to other loans, but when you consider that most payday loans were originally calculated to be paid off within two weeks, clearly there is something wrong. The destructive interest rates will often cause people to find themselves stuck in a cycle. They never seem to find enough money to repay the loan. Some borrowers will take out a second loan to repay the first. This process continues, debt grows, and you that quick fix becomes a long term problem. Taking a payday loan of just $100 can cost you $300 in fees. Yes, this is a 300% fee. That is not to say all loans come with such heavy costs. However, payday loans are supposed to be paid off quickly. That means lenders won’t have long to collect interest from you. One way they compensate for that is to charge hefty fees and, as discussed, very high interest rates. Consider the time it has taken for you to open up a bank account, apply for a credit card, or take out a loan from a bank. Each of these transactions require time, background checks, and other careful considerations. Payday loans can be completed in less than an hour; the process itself is hasty. This works to the benefit of the lender who wants to lock you into a contract quickly because this often guarantees they make money, even if you change your mind soon after taking the loan. 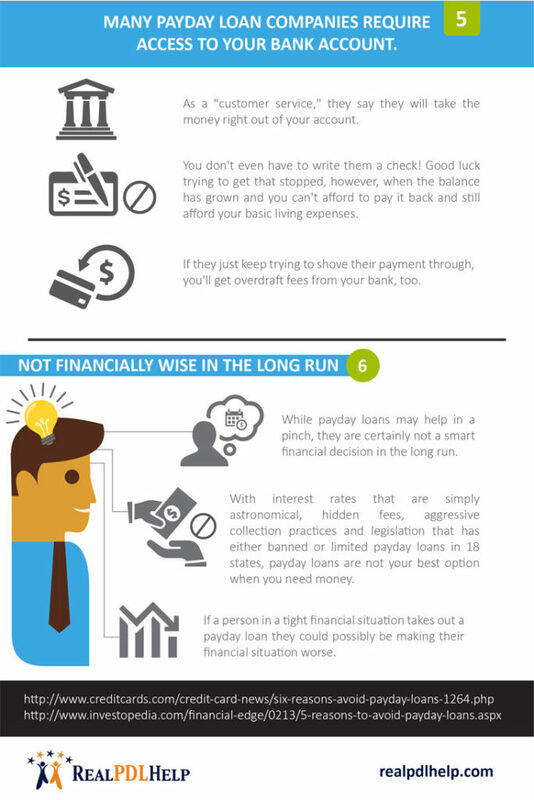 Many people are realizing that payday loans are dangerous and can cause significant financial struggles. That is why 18 states have now put limits or completely banned payday loans. In short, payday loans are a poor financial decision. The situation that leads somebody to consider a payday loan is often stressful; however, by taking a loan it only delays and transforms the problems. To further highlight the financial dangers of such a loan, consider also that 1 in 3 borrowers from online payday loan lenders dealt with fraud and abuse in connection to their loan. Stay out of the danger zone by simply staying away from Payday Loans. If you are already in a bit of a mess with loans making you feel like you are drowning with no way out, give us a call. We can help you consolidate your loans and get out of debt faster.